This week on General Hospital, relationships are put to the test as secrets come to the surface. After a night of passion, Valerie wakes up next to a happy Dante. Meanwhile, Laura convinces Lulu that she isn’t ready for a formal separation from Dante. Full of hope, Lulu heads out to repair her marriage. GH Spoiler: Dante & Valerie Have No Regrets|Lulu decides to go talk to Dante... who is in bed with Valerie.|After a night of passion, Valerie wakes up next to a happy Dante. Meanwhile, Laura convinces Lulu that she isn't ready for a formal separation from Dante. Full of hope, Lulu heads out to repair her marriage. Will Helena reverse Jason’s memory loss? Sabrina receives a surprise visitor. Will Lulu file for separation from Dante? 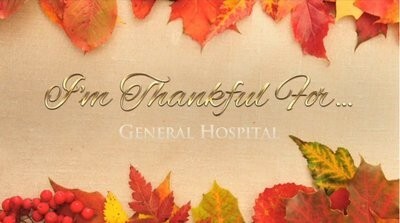 It’s Thanksgiving in Port Charles and some are more thankful than others this year. Anna makes a confession to Andre.